An Israeli border police unloads a torrent of tear gas in the Quiton neighborhood of Hebron. Palestinians living in Hebron / Al-Khalil repeatedly face teargas, sound grenades, and other violent measures deployed by Israeli forces. Christian Peacemaker Teams accompanies Palestinians living in H-2 / Israeli-occupied Hebron and documents the Israeli military’s use of violence against the people living there. The numbers below tally up-to-the-hour incidents of teargas and sound grenades in the areas of Hebron’s Old City that CPT and the International Solidarity Movement monitor. Much of the physical violence that CPT witnesses occurs around Israeli military checkpoints while Palestinian children are walking to and from school. Rounds of teargas have also become a default military response to any expression of Palestinian dissent, including nonviolent demonstrations. Teargas, sound grenades, skunk water, rubber bullets, and live ammunition present both physical and mental health threats to the Hebron community. Children have been hospitalized due to excessive teargas inhalation, and the continual displays of violence work within a military strategy of mass intimidation and collective punishment. While recognizing that we are only able to record a fraction of the atrocities that occur, CPT Palestine is committed to documenting these human rights violations and intervening when appropriate and possible. By sharing these numbers, we strive to amplify the stories of those who are experiencing the most injustices and promote a narrative that calls for peace with justice. 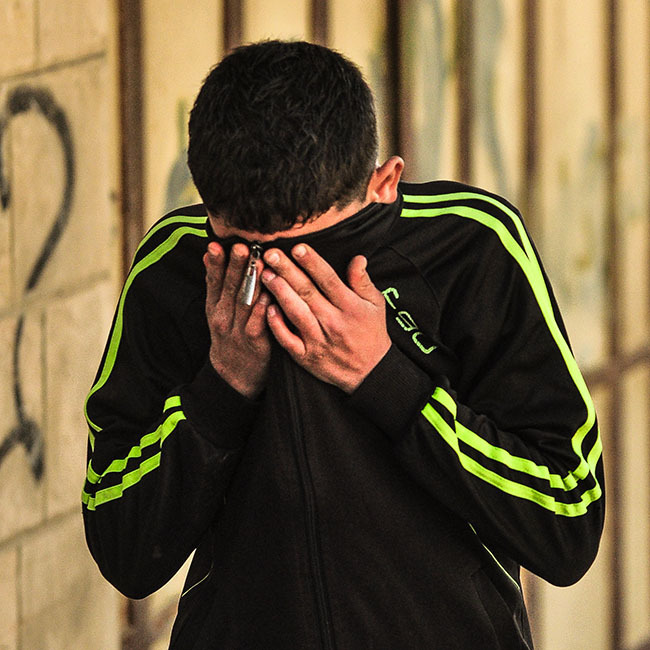 A young Palestinian boy struggles to find safety during an Israeli assault with tear gas.